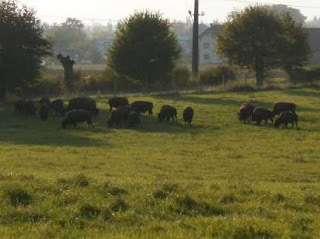 Yes, these are buffalos quietly grazing on a pasture above the LHC ring. You would think that buffalos in the Geneva area should be a rare sight. I thought so too at first, but then i realized that they can also be found in Fermilab. And in an instant flash it all became clear. The only logical explanation is that both the LHC and the Tevatron have been designed by buffalos who are in reality the second most intelligent species on Earth (after dolphins). The hadron collider installations must serve some important purpose that is conspicuous only to higher beings. To keep us humans motivated, the buffalos made up the hierarchy problem, supersymmetry, extra dimensions and string theory. The mystery to solve is what is THE question the LHC is supposed to answer. Once i find out, i'll let you know. You missed the point. Hadron collisions produce buffali. If you walk around that area, you may detect some gluons with the bottom of your shoe. No buffinos or buffibrains - no deal. Hm... you just show a shot of the CERN management, as well as how CERN looks in 20 years according to their dreams. The best explanation I've heard for string theory. Just fabulous.